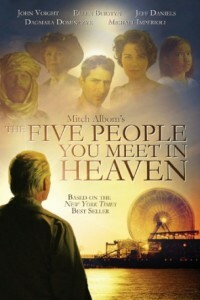 From the author of the phenomenal #1 New York Times best seller comes the original screen adaptation of Mitch Albom’s The Five People You Meet In Heaven. This New York Times best seller is brought to life by an award-winning cast including Jon Voight, Ellen Burstyn, and Jeff Daniels. The NY Times praised it for its “genuine power to stir and comfort.” Mitch Albom’s The Five People You Meet in Heaven explores the unexpected mysteries of the afterlife by reminding us what really matters here on Earth.